*Team effort with E on this day’s title. We’re having fun coming up with these. 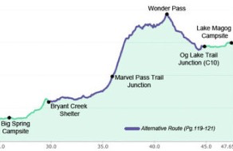 Today is said to be one of the highlights of the whole trail. 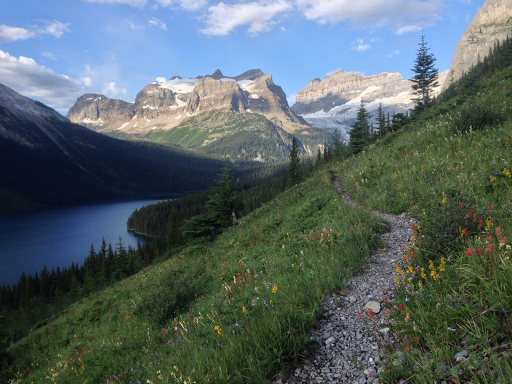 The trail goes right by a very popular destination in Mt Assiniboine Provincial Park. To really take it in, we decided to schedule a short day to camp there and then spend the rest of the time day hiking side trails. The morning started off at our regular 6:30am start time. Again, rain/storms were forecasted for 60% chance. The first couple hours of the morning, it rained lightly here and there. 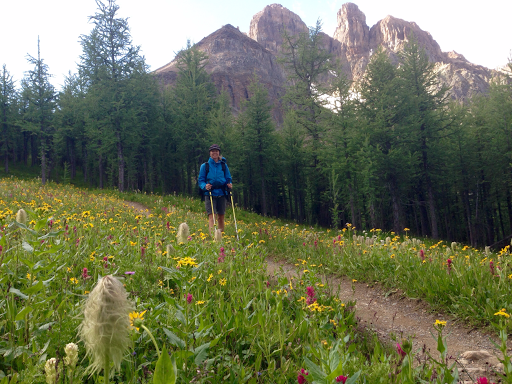 We did a short alternate that parallels the GDT to take us over Wonder Pass rather than the wooded Assiniboine Pass. It’s a bigger climb, but has more of the alpine views. 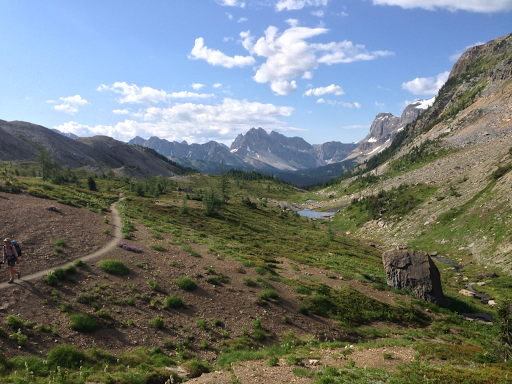 We started off along Marvel Lake with plenty of wildflowers and mountain views as we hiked up. We even heard and saw a rock avalanche come down across the lake on a mountain side. Second time this trip. So surreal to see. 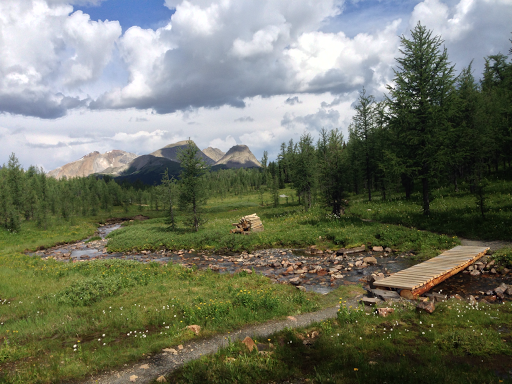 Wonder Pass was nice and much quicker than we anticipated. 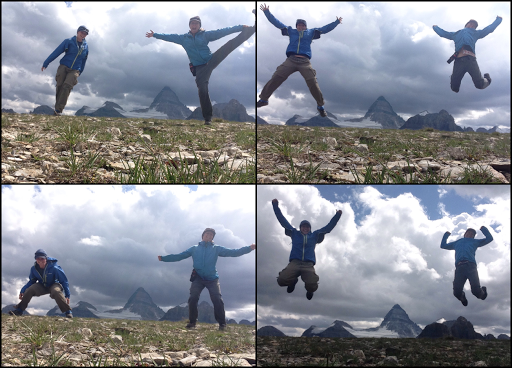 We heard it’s a much better intro to Mt Assiniboine Provincial Park and it was quite pretty. Here’s the view looking back as we approached the top. Once we got to the top, we saw our first people of the day. The 29 site campground of Lake Magog is just on the other side of the pass and our destination for the day. It’s quite a popular area and we knew we’d see plenty of people today. Here’s the view from the top of the pass. 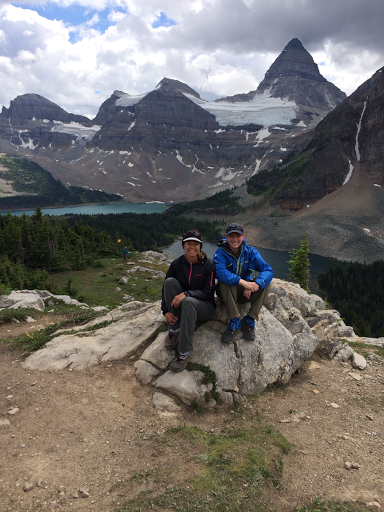 We then came through a picturesque meadow that took us to our first views of Mt Assiniboine and Lake Magog. It was quite grand and impressive. Again, pictures don’t do it justice. We were really glad the clouds stayed high and that the weather held today! The campground is on the far end of the lake. 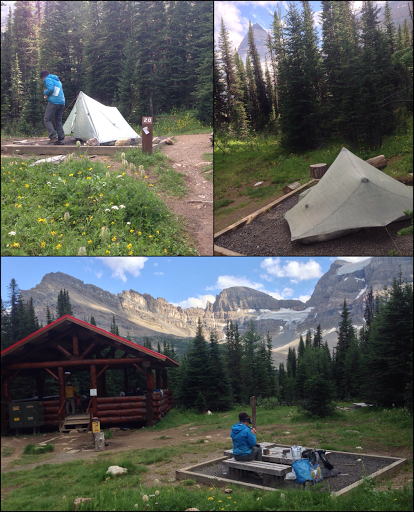 We arrived at the campground 10mi/17km into the day around noon. Many of the sites were already taken (it’s a Wednesday). We wandered the maze of tent sites and chose two that were protected if it stormed, close enough to a bathroom and eating area, and removed enough to feel more remote. Hardly any site had views of the mountain since they are sheltered and in the woods, but that’s ok since we got to see plenty today. Plus, the eating area had a nice view and a covered area to eat if it rained. We rock, paper, scissored for the better site and I won. 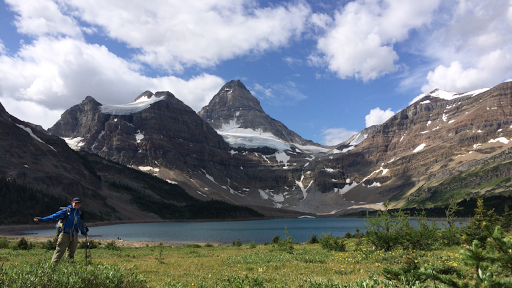 It has a partial view of Mt Assiniboine through the trees that I can see and that’s nice. Once we got settled, we ate lunch and then headed out at 1:30pm to do some DAY HIKING. Yep, hiking without all out gear! It was sooo indulgent and freeing! I still carried my pack to have all my layers and rain gear if it rained. 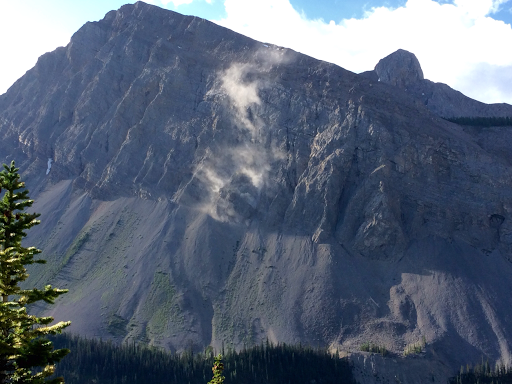 Dark clouds were looming and we have been wondering when our weather luck would run out….well, apparently not today! We were sure it’d hit today and somehow it didn’t despite the dark sky in the afternoon. 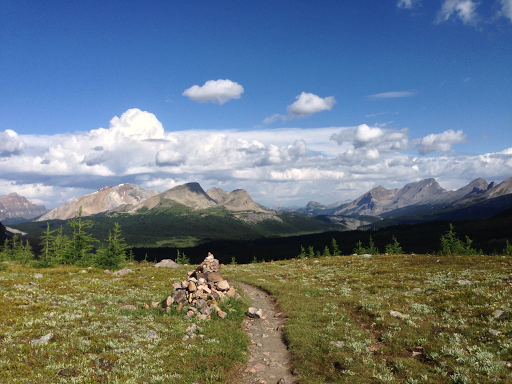 We day hiked an additional 6mi/9km along a loop of the Sunburst Trail and up to see the views from the Nublet and Niblet. So fun! It doesn’t even feel like we are thru hiking and it was like we were tourists on a relaxed weekend trip. Here’s the view along Sunburst Lake with Wedgewood Peak. 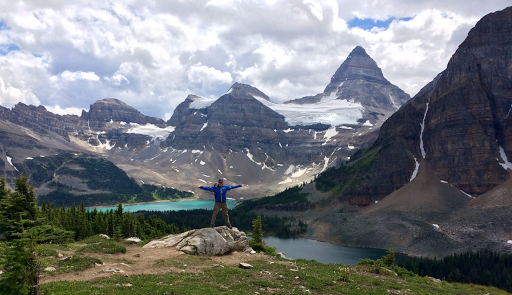 From there, it’s a short climb up to the Niblet with a cool view looking down on Lake Magog and Mt Assiniboine. 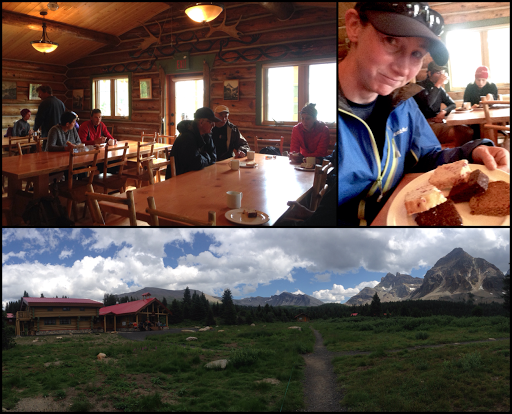 To finish up the loop, we went by Assiniboine Lodge and they were serving tea and cakes. I couldn’t resist and had to get the cakes. Good stuff!